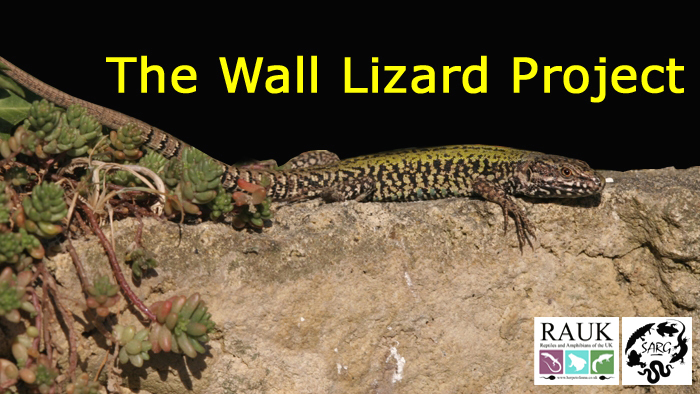 The Wall lizard project is an initiative by SARG and RAUK e-forums to determine a baseline for the presence of the Common wall lizard (Podarcis muralis) within the United Kingdom. The project works closely with other UK herpetological organisations including County ARGs, ARC and the BHS. This page lists the known 0 UK sites, and you can view further details by clicking on any of the icons at the bottom of the page. More information concerning the Wall lizard's ecology can be found here: SARG Wall lizard page. If you would like to become involved in the Wall lizard project, as a volunteer surveyor, please look at our 'Involvement' web page. Langham, S. "The Wall Lizard Project" Surrey Amphibian and Reptile Group; 2019-04-24. 2019-04-24 <http://surrey-arg.org.uk/SARGWEB.php?app=PmSitePicker>.